The world's largest particle collider is scheduled to go back online at about half power this fall in an effort to get the problematic machine working on some science. The European Organization for Nuclear Research, known as CERN, said today that it is trying to get the Large Hadron Collider (LHC) working by November after a series of problems, from electrical trouble to leaks in its vacuum tube - derailed it since it was first tested last September. The $US10 billion collider was built in large part to help scientists discover how the universe was created. 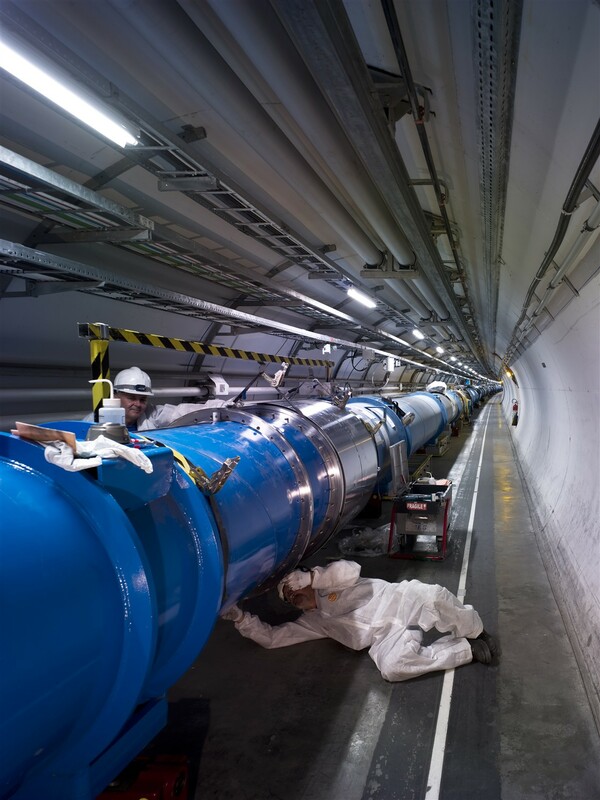 James Gillies, a spokesman for CERN, told Computerworld that even though the collider won't be running at near full power, it still will be "substantially" more powerful than any other collider operating. He also said that because of the size of the machine and some of the controversy surrounding it, the world is watching and for nearly a year scientists haven't been able to use it. It's time, he said, to get the collider fired up, even at half power. "It's been a project a long time in the making," Gillies said. "There are scientists and students out there waiting to collect data. There is physics to be found out there ... Our priority for this year is to get data." Located on the Franco/Swiss border, the collider was built to shoot two particle beams around a 17-mile underground, vacuum-sealed tube in opposite directions on a collision course. Smashing the beams together will create showers of new particles that CERN hopes will recreate the conditions in the universe just moments after its conception. The goal is to provide scientists with data that can be used to answer one of humanity's oldest questions: How was the universe created? Gillies noted that scientists also are hoping to use data from the machine to discover more about dark energy, a mysterious force that is thought to cause the universe to expand at an accelerating rate. He also said some researchers are hoping the collider will help them prove the existence of other dimensions. The collider has been plagued with troubles since its initial test runs last fall. In late September, CERN disclosed that a faulty electrical connection had knocked the collider offline for two months. Then, just a few days later, the organization said the collider would remain down until this spring. Gillies explained that that initial electrical problem damaged 53 out of 1,600 magnets inside the collider. "We needed to repair it and understand what went wrong, and how to keep it from happening again and as badly," he said. CERN engineers and technicians have repaired or replaced "thousands" of electrical connections, said Gillies. They also found and repaired problems in the interconnections between the superconducting cable and the copper that wraps around it. The faulty interconnections weren't allowing current to flow as quickly as it needed to, he said. Last fall, CERN estimated that it would cost $US21 million to repair the collider. This week, Gillies said the cost is closer to $US38 million. "It's a large sum of money. There's no mistaking that." Gillies said the plan initially was to have the collider run from spring through November. But since the collider has been down for so long, once scientists get it running, they want to keep it running. That means they plan to run the machine from November through next autumn, despite the higher energy costs during the winter months. "I don't think there's been undo pressure on us, but there's a feeling that we need to proceed with caution and do so as soon as possible," he added.